It amazes me that you see an issue with null sec mining rates yet see no issue with invulnerable neuting hictors that can jump 10LY. How does leaving that mechanic in place help game play? Man, it's as if GSF members are mailed talking points every morning to spout en masse on the forums. It's almost like anyone that has any interaction with these game mechanics sees what the glaring issues are. Here's the thing - I was one of the Rorq pilots on the D-W beacon - so yes, I've had a little experience with these game mechanics. So take it from me when I say that it doesn't take a unrealistic re-adjustment or a stretch of the imagination on how to counter a PANIC'd tackle Rorq. It may mean your supers who are fit for max-tick ratting will have to refit before jumping in and committing on any kind of actual PVP, however. Oh, the choices one must make. Maybe you all will realize this along with realizing that the mining yield nerf isn't actually that bad. With the nerf amount, it's pretty obvious that whoever came up with the original yield number forgot to account for the mining drone rigs and they're correcting for it sooner rather than later. IOW, past buyers who paid more for their Excavators will receive 32% less yield, while future buyers will have the benefit of knowing the new specs and getting them for less cost, due to the drop increases. In the interest of being fair, will you also be rebating skill points and isk for those of us who sold off lots of assets and worked our asses off to get into Rorquals and Excavators based on the original economics? Also, when you say "Increasing the drop rates of the Elite Drone AI," does that include changes to Rogue Drone Patrols? As things are now, only a few Patrols will drop one AI chip, but the sites are so frig-heavy that they're not economical to run compared to Hordes, even at 10M isk per chip. 1 MINING RORQ = 6x PERFECT HULK (best bonuses) this will be less due to drone movement. 1 MINING RORQ = 4x PERFECT HULKS (best bonuses) this will be less due drones movement. I'll take maximum mining from rorq fit. Rigs for mining are most bad idea, but i've took to show math. So right now mining rorq from point of view of mining - looks like CAPITAL INDUSTRIAL SHIP, mines like hell. But with nerf (-32%), 5min being flying frag-brick, prices on drones and hull, and without mining rigs (to add more survivability) - rorqual will not be in my eyes - CAPITAL INDUSTRIAL SHIP. RORQUAL will be just 3 hulks and absolutely not worth investment of 11bil into it. Increasing drop rate of drones components will lower prices on excavator drones in some time, if there is no nerf implemented. With implementation of nerf, prices on excavator drones will drop, because no one will buy them. I feel sorry for those who invest a lot into rorquals. +15-20% increase of speed to excavator drones. not only that, but you're stuck in one spot for 5 minutes... and the drones are retardedly slow. you're also a 6+b killmail... so people LOOOVVE to kill you. it's alll about risk vs reward... that 32% is gonna really screw the reward, 15-20% seems more realistic. We have established that the yield estimate in the blog is missing a ~50% multiplier. People have been endlessly wondering how the 2000 drone dps in the dev blog was arrived at. 5 Ogre 2's with T2 core and 4 T2 drone damage amps give us 1352 dps according to pyfa. 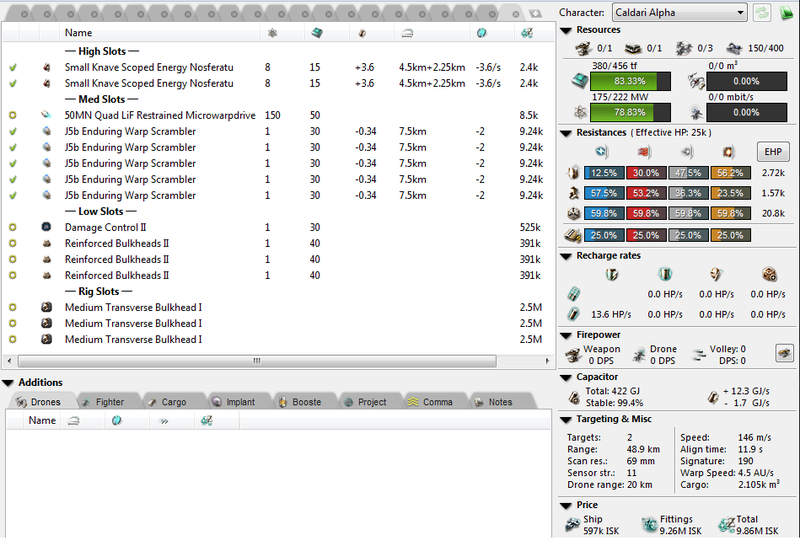 Try using Augmented drones, also what happens if you use Sentries with max Sentry DPS rigs. Also fill all your low slots with W-634 DDA's. The fit to get the max DPS they used is not really sensible. Garde 2's will do 1168 because the sentry rig is stacking penalized with DDA's. The third rig does literally nothing and the second adds 1 dps. With T2 core, 4 of the best officer drone amps, and a set of Augmented Ogres you get 1636. The only way you are getting anywhere near 2000 dps, is by adding 7 faction smartbombs to the fit for a total of 1986 DPS. The EP-705 implant will push you to 2005. Core off the officer + smartbomb fit is at 1007 drone dps + 368 smartbomb dps. That doesn't add up either. Now in theory activating the core adds a 100% drone damage bonus so you would think 1007 DPS would turn into ~2000 dps. But those pesky stacking penalties poke their heads out again. That last Officer DDA, being a 5th mod when sieged, adds a whole 44 dps. can we at least disallow PANIC whilst an entosis link is active? That is one of the few things a Rorqual can not do. I think CCP's decision-making staff needs to be reduced by 32%. "Hey everyone. We've been keeping a close eye on how people are using the newly rebalanced Rorquals and it's been really exciting watching how well people have taken to the new gameplay." So exciting that we decided to make you a present for chrismas... here a nice -32% nerf! It's pretty clear that everyone is against the kind of nerf you are planning... CCP at it's finest. This is absolutely disgusting. 32% is far too much. My drones currently mine 1340m3, with the nerf that's 911m3, times that by 5, thats 6700m3 to 4555m3. Way to go to kill the mining community. We spend billions, are sitting ducks for 5 minutes and this isn't good enough? I swear. I feel like quitting. That's how angry I am. And they announce this days after I plex my accounts. Seriously considering not plexing my accounts after christmas. Yeah. Me and a load of people are not happy. Imagine spending 7 months of skilling just to FLY an Orca and an Iteron V and then having CCP fck you over by making it possible to fly both in less than 2 weeks. This is only the tip of the iceberg for the many ways CCP has screwed me over. This however is beyond even their Icelandic douchebaggery. I have 13 accts and spent the last month and a half investing through ISK and skills to put some industrial gears into motion... This may just send me over the cliff for the last time. ANOTHER FOZZIE WONDERFUL idea... . we finally get some love for the miners and leave it to fozzie to skullf**k it so hard. The only patch i want to see is "Fozzie quits Eve" i think the population would jump 20% in eve. 32% nerf.. Jesus is that nerf bat heavy,, are you able to pick it up by yourself? It Seems That A Lot Of People Are Unhappy That They Might Have To Risk Something To Get Isk Now ? Are you serious? This has literally been live for like 5 mins and you're already taking it away. Do you even want people to keep playing your game? Do you even care about all the people who spent time, money and effort. Injecting, building and farming there way into a ship that 1 month later they don't even want. Is this CCPs new business model to get people to keep extracting and re injecting? 32% is such a huge Nerf to an already limited ship, I have a question for you. After running and developing Eve Online for 10+ Years how is it you can't balance this before you release it so you don't have to "fix" it one month after launch. If the rorqual had released with 32% less yield at least we would have known it was a bad investment. Now we're all stuck with 10b plus investments, it's an absolute joke. Yes this is the new business model. CCP will start putting out revamps on unused, mostly untrained ships, buff them to high heavens and then once the skill injector markets calms back down, they will nerf them back to reasonably broken levels. You are exactly right. There is no other explanation for it if you have objectively looked at the game over the last 3-4 years. This is how WoW works, League of Legends, HOTS... Buff old, unused classes/heroes, keeps players buying/subbing, nerf what works well.. rinse and repeat. If I hadn't been playing Eve the last 3 years simply off of PLEX I would have never logged in again. When my ISK runs out I may sell for a boat load of ISK or may simply just never return. Right now it looks like never returning is option A. Right, because the time investment of simply getting into a Rorqual is like 3 hrs right? And the time investment of properly fitting a Rorqual is.. even less, like 2 hrs right? Oh, and they are going for less than Minmatar shuttles on the market too now.... right?? Maybe your idea of risk is Catalyst ganking a Retriever in a starter system? Probably. What ? Man That Is Against The Rules ... You Do Not Seem Very Smart . You Also Have An Issue Accepting Risk Vs Reward Too ? ? Without a large increase in base drone speed, it is barely worth mining in rorquals now. People invested a lot of isk into rorquals, only for you to nerf them one month later. I feel sorry for anyone who actually bought plex for this release. So CCP, was this just a poorly thought out release or a bait and switch cash grab? What if using PANIC required an active idustrial core? It would at least leave the pilot unable to navigate for the majority of the invulnerability duration and there is little detriment to legitimate uses. Then again, it affects other industrial ships in the area. It would just make tackle badgers a thing instead. What's the counter-play to n+1 of those i wonder. Is there a legitimate reason for ships affected by panic to even be able to lock targets? That would limit abuse to invincible ECM burst and a mostly invulnerable shield burst platform (why marginalize shield command ships?). A bit curious why this rather expensive drone is being nerfed. I don't use a Rorqual (I don't mine much or often) but the idea that you now have a decent reason to use one in the belt was nice. If Rorquals can tackle with impunity, may Citadels also tackle while invulnerable now? Otherwise, you are going to have to allow ewar to be usable on the Rorqual while it is in PANIC mode. Should drop the price for the excavator drones. So you shouldn't have to worry about the 10 billion isk rorqs. Because that won't be the eventual price. The elite drone AI's are currently selling at 12 million. Before the requirement was announced, they were pretty close to worthless. A higher drop rate should drop it. Everyone understands that and it is still a horrible change. So much for wasting 12b on this over the last little while. Thanks CCP, I want my ISK back. Mining rorqs were always better than the dev blogs suggested they should be. Adjusting the game to align with CCP's balance vision is a good thing. When the dust settles, people will still be mining in Rorq fleets. The way this adjustment was made could bear improvement. Players dropped a lot of isk fitting rorquals based on their expected yield and component scarcity. With no time to adjust plans based on the new value of these assets, early adopters have a long road to recap their losses. Could you revisit the compromise used when kicking rorquals out of astrahuses -> delay the nerf for a while? Giving early adopters some time to benefit from their investment while the market adjusts to the new plan would help a lot. I said it on a recording sullen was doing during the rorqual focus group fozzie is an idiot. Keep sucking on that Pl **** man. You just kidding me! I spend lot of buyed plexes to train my 11 rorquals! Builds lot of excavators! and now you nerf my investments and incom! WHY??? WHY CCP SO F..... STU.... ? Someone is shocked to discover that the flavor of the month is sometimes literally the flavor of the month. It's certainly a more informed vantage point than 99% of GSF who are just parroting the company line. In the mean time, keep jumping your ratting-fit supers into PVP situations whose only hope is to kill the thing tackling it if things go south. Damn, if I can't be more obvious about what the counter is, I'm not sure even CCP can help you. Clearly the solution is to Neut the invincible capital ship who is receiving capacitor transfers from other invincible ships right? Preferably with your own invincible neuting ships of course. What enthralling gameplay we have here. I'm sorry but I must be missing something. EVE is a PvP game, so I have heard for many years. It is also a MMO, not a solo game. So if the ore does not flow the price on the market goes up. Cost of ships up means people have to grind (what ever ISK making thing you do) to buy said ships. Wouldn't it not be better to have more ore so price is down to enable more people to explode ships instead of spending their time making ISK to buy said ships.